The Pax 2004 Kobler Family Syrah was one of the best Syrah’s that I’ve tasted for this blog. It had an elegance to it that was only paralleled by the La Bruma Syrah from Peay. When I found the Pax, I didn’t know much about the history behind the winery and was saddened to learn about its demise. I wondered if anybody was still getting fruit from the Kobler vineyard and was delighted to find that not only was a winery making wine from Kobler but it was basically still Pax Wines but with a new winemaker and a new name, Donelan Family, which is the namesake of Pax Mahle’s ex-partner Joe Donelan. Pax’s current project is Wind Gap Wines, which I love, and I have to admit I was a little suspect as to whether Donelan would continue live up to the legacy that Pax had left behind. Enter Tyler Thomas. He took over Donelan’s new project and quickly had to learn the ethos of Pax Wines. He tasted and tasted, making his way through different vintages and vineyards to get a sense of the wines and what to expect from them as they aged. In the end he decided that the ethos of Donelan should be to celebrate the diversity of its spectacular vineyard sources. I have to admit that this diversity does mean that some of Donelan’s wines are a bit rich for me. The Obsidian, which is its flagship wine, is not my cup of tea because of its big, brawny, richness, but it’s a well-made example of a wine made from the fruit of that warmer vineyard. The Kobler, on the other hand, is most emphatically my cup of tea. It’s a wine made from one of the cooler vineyard sites in the Russian River Valley. I opened the wine one night but I let it sit on the counter opened with the cork stuck back in after an unexpected allergy attack rendered me unable to smell. The next day the wine was singing and I was so glad that I had opened it and fortuitously had to leave it out. At only 12.5% alcohol, this is an elegant Syrah. The nose has plum and strawberry aromas that are laced with flowers. It’s a Syrah that’s light on the palate with great acidity and smoothness. I know “balance” means a lot of different things to a lot of different people but this is a wine that for me is the epitome of balance–it’s smooth but has an energetic mid-palate that keeps you wanting to drink more. The finish is nice and dry and makes me think of how well it would pair with meat and dark sauces. I didn’t detect as much of the black pepper and black olive that I did on the 2004 Kobler, but it’s possible that those flavors would develop as the wine aged in the bottle. There’s also less whole cluster on this wine (40%) than in previous vintages because Thomas was concerned about bringing out the fruit in such a cool year. That may also account for the wine having a tad fewer savory components than the ’04. 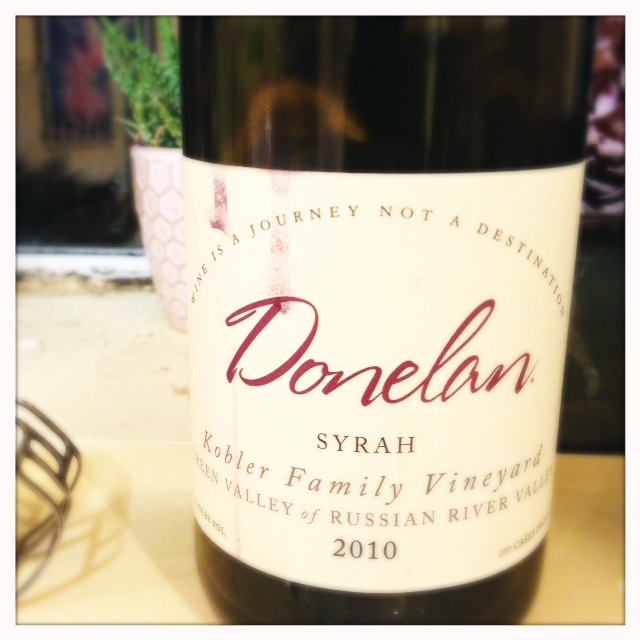 As a cool-climate Syrah lover, I’m thrilled that the transition between Pax and Donelan did not result in the Kobler Family vineyard source being laid to the wayside. This fruit is too good and it remains a great example of what can be done with Syrah in California’s cooler micro-climates. Sadly, the cool 2011 growing season and late rain made it impossible to harvest the grapes from this vineyard and there will be no wine made for that year. 2012, on the other hand, was a stellar vintage for all of California and I look forward to tasting what Thomas has done with this special vineyard for vintages to come. Anaba has a little tasting room that perhaps you’ve seen sandwiched into a little spot in Sonoma where 121 and 116 meet. It’s a small tasting room and has a decidedly more down-to-earth feel than many of Sonoma’s bigger more corporate-looking locations. It’s had a Rhone focus for a while, although on my last trip its was also tasting Chardonnay and Pinot, and they do a good job with those varieties, but it’s really their Rhone varieties that pique my interest. Anaba is not a natural winery, in fact, I can tell by the smoothness and richness of its wines that they are probably more manipulated than many of the wines that I’ve written about for this blog. But man, is the Syrah good. It’s got this meaty/bacon-y aroma couched in dark chocolaty blackberry fruit. That may sound like an anomaly for the wines I’ve been tasting and liking for this blog but for some reason I’m feeling this one. I think it’s because it’s a throwback to the wines that got me into Syrah when I had an inexperienced palate. It reminds me of the early Qupes and Andrew Murrays that I used to drink by the liquid ton. It’s not a sweet wine though. It’s just rich and doesn’t have a whole lot of energy or verve on the mid-palate. But what it does have is some great fresh acidity on the finish and I think that’s what keeps me coming back to drink more. This is a nostalgic wine for me, one that reminds me of the wines I drank that gave hints of the aromatic possibilities of Syrah but weren’t too much of an acidic punch on my uneducated palate. It simply smells and tastes delicious and that slight back-end acidity makes me want to keep lifting my glass. Unfortunately for me and for the rest of you cool-climate Syrah fans, (yes, all four of you), I received an email from the winemaker for Anaba, Jennifer Marion, in which she explained that she is no longer working with fruit from Las Madres vineyard. Instead, she’s switched her focus to another vineyard in the Mayacamas mountains called Bismark. Marion says that she’s excited about the fruit from Bismark because it gives similar phenolics as Las Madres but also ripens more consistently since it is above the fogline. Although she loves the fruit from Las Madres she just worries too much each year wondering if the fruit will reach optimal ripeness. 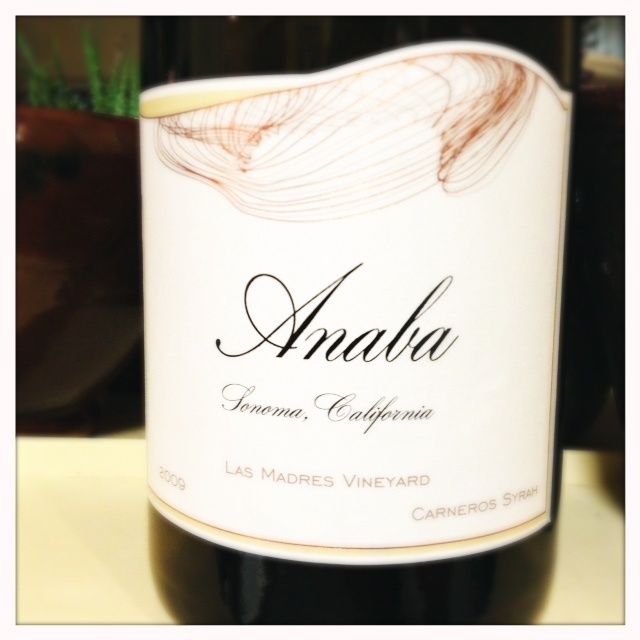 I’m saddened by the loss of the Las Madres vineyard from the Anaba portfolio. Yet, I understand that from a business perspective vineyards with a lot of vintage variation can be a harder sell. Marion said that if she could choose, regardless of money and consistency, she would choose to “roll the dice” with Las Madres because of its amazing aromatics. A quick internet search showed that quite a few other wineries are making a Las Madres Syrah, and I’ll definitely be searching these out in order to taste more fruit from the Las Madres vineyard, especially from the cooler 2010 and 2011 vintages. I wish that the wine industry were strong enough at the moment to support wineries that occasionally had wines that in some years didn’t quite reach “full ripeness”, and simply needed a few years in the bottle to eliminate some of those greener, less ripe aromas. Much of what is being written about California right now is that there is a shift in styles back to a more restrained style. I know that that is definitely true in some cases but I wonder if that impact is seen in the larger customer base that most wineries must cater to. Vintage variation in much of the world is a common and expected outcome of making an agricultural product such as wine. Yet, in California where most vintages are consistently ripe, it’s possible that consumers have become spoiled in expecting such consistency. It’s that consistency that brings talented winemakers to California but it also can hinder winemakers who otherwise might love to take a chance on grapes that might not get ripe every year. I wish that it was more feasible for wineries in California to “roll the dice” every once in a while to really show that wine, just like weather, is a product of the earth.